reetings it is I EL MOYRA who joins you. As ever, we place our consciousness within the spectrum of this Temple and it is intimate this day for only those who are in their earth consciousness are present. There is good reason for this, for what is to be spoken applies to those who expand through human consciousness and the energies draw tight as the group consciousness congeals. I come in a higher capacity than as an Ascended Master and no more shall ones of the fifth-dimensional aspect come to you. Perhaps, it is timely to think beyond dimensionality altogether, for that in itself is a limitation. There are levels and layers to this linking and I would say to you that, though small in number, you have created between you a greater purpose and linking that is at a much higher attainment. Although each goes their separate direction in life, what links you has commonality, yet is perhaps not perceptible on the surface. It is part of the greater plan set in motion by the soul of each and then further still, by your Oversoul and so on. We know that all souls upon the earth fulfill the Divine Plan for this world, even if it seems so disparate. It is organised by an intelligence greater than our own. So, each time you come together it hastens this change and linkages grow stronger. The organic nature of change is such that the more you congregate, the more concrete the pathways become, ensuring that what shall unfold does so with the utmost support and grace. Change is always internal no matter how it is done and you are changing. Sometimes the human soul brings greater change to your doorstep at junctions in time deemed necessary for an acceleration of purpose. There is still so much to release; so many sorrows that weigh the heart down and dim the light within you at times. No matter how often you meditate or commune with the higher realms, you are inescapably human – this is your challenge and your beauty. To find the strength within humanness and to tease out its magnificence, shall bring grace and strength beyond what you know and shall serve each well. Just as you seek outside of yourselves to the higher reaches, in equal portion, it is necessary to seek the universe within. It cannot be otherwise. The more that you turn your face toward the attainment of mastery and all other hopes and wishes for the spiritual self, a mirror then is always set before you until such time as what you see as the goal and what is reflected in the mirror, are as one. The level of attainment is self defined. What is within the universe of yourself is reflected in this mirror. It is not to become perfect, that is not the goal. It is not to be free of all fault, for truly that is irrelevant, as what can be mined from within is far beyond such notions as this. The mind perceives, governs and acknowledges the stony pathway of human life and that continues and is fine. Yet, this pathway, as with all things, is multilayered and a river of light can pour forth. So, mastery (your idea of it) is in parallel to the self that you know. It does not replace or usurp, for all is multidimensional. The conscious human self will always stumble but stumbling on your path does not mean that you do not flow effortlessly upon the river of attainment at the same time. There is a depth that is so incredible within the human aspect and you are quite capable of multitasking; living out your human lives yet coming into mastery. Human mastery is different to mastery when not in form, but it is mastery nonetheless. It is mastery within a framework. You would not ask preschool children to sit a university exam and I say this not to diminish you. Gentleness is required at this time. You can be too judging of others and then by turn, too hard on yourself, with so much energy expended on cycles of the human mind and emotion. The gentleness of spirit can bring a space necessary to allow attainment to pour in and heaviness to flow out. Kindness arrives from the heart of God. Kindness to self – what a wonderful gift. When you are kind to yourself, you nourish your soul, for you are your soul's invention. How can you put in place a gentleness that lasts, yet allows for dynamic action when needed? It is time to breathe, my friends. You have all the time in the world in one sense and each breath is God-given, arriving from the Living Light. Take time to just 'be', not with any technique nor with spiritual practice. To simply take a breath and be mindful of it, knowing from where it comes, brings great gentleness. Take a glass of water required by your body and then marvel that water exists in its purity, beauty and uniqueness. Then, see the glass that holds this water and marvel at the cleverness of human consciousness. When gentleness flows in and around you we can welcome change, for then we are disarmed and not surprised. When we gather in spiritual groups a linking occurs at a much higher level. Change is always internal and is orchestrated by our soul when necessary. When you seek mastery, a mirror is set before you until such time as the goal and reflection are one and the same. You are not expected to be perfect as mastery can form a parallel pathway alongside your daily human life. As such, you can stumble yet still have spiritual attainment. You are encouraged to be kind and gentle with yourself as this nourishes your soul. The more that you turn your face toward the attainment of mastery and all other hopes and wishes for the spiritual self, a mirror then is always set before you until such time as what you see as the goal and what is reflected in the mirror are as one. 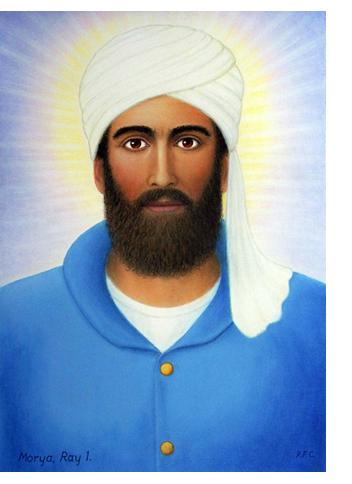 El Moyra (also spelled El Morya) is often referenced as a spiritual scientist whose energies bring an alignment with the Will of God.